After this article was published, TimePilot began offering a backup battery/surge suppressor for Vetro. Click here for details. Let’s talk about power. The kind that comes from an electrical outlet. Every once in a while, you’re going to lose power—whether it’s from a lightning strike or a downed wire. If you’re running TimePilot Extreme, it’s no problem—Extreme is battery powered. But what happens if you’re running TimePilot Vetro, which gets its power from an electrical outlet? First, and most important: Any clock-ins or clock-outs collected by Vetro are safe. Power or no power, it doesn’t matter. The same goes for your employee setup information. It’s all safe. However, when power is lost, the clocks will lose their date and time settings and will have to be reset when power returns. This process is automatic if you’re using your Vetro in Network Mode; if you’re using your Vetro in Standalone Mode, you’ll need to reset the date and time before employees can clock in or out. If your Vetro runs in Standalone Mode—that is, not connected to a network—all the data is retained in the clock’s memory. It’s called “non-volatile memory,” which means that if power is lost, it continues to “remember." When power comes back up, the clock will ask you to reset the date and time. After all, the clock can’t tell how long it hasn’t had power. To do that, enter your administrative password on the clock and follow the instructions that appear on Vetro’s screen. Please note that employees can’t clock in until the date and time are reset. Will that be a problem at your company? There is a solution. 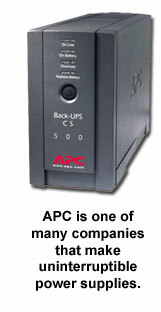 It’s called an “Uninterruptible Power Supply”—also known as a UPS. You’ll plug the UPS box into an electrical outlet and plug the Vetro into the UPS. The UPS contains a battery, a sensor that detects if you’ve had a power outage and several power outlets. Many also include a surge suppressor, a device the Vetro User Manual suggests you use to protect your system. If you have a blackout, the box instantly switches you to battery power. When your electrical utility restores service, the UPS reverts to power from the outlet and recharges the battery. With a UPS, the Vetro remains available to employees for clocking in and clocking out. UPS systems start at around $80. Even an inexpensive system should be able to power the Vetro for several hours. If your Vetro runs in Network Mode—it’s connected to a local area network—your data and employee setup information also is perfectly safe. If you were running the Vetro Data Manager on your PC, the clock had a “live” connection to the network and every clock-in and clock-out was instantly transferred to your hard drive or server. When the power comes back up, the Data Manager will reset the time and date automatically. If you weren’t running Vetro Data Manager at the time of the power outage, the data is safely stored in the clock. When power comes back up, start Vetro Data Manager. It will automatically reset the date and time on the clock and download the clock-in and clock-out data to your hard drive or server. If you want to avoid system downtime altogether, the UPS solution described above would work here, too. See the previous section for details.